English artist Olly Moss says he's disappointed, but not upset, that Gearbox made unauthorized use of his work in Borderlands 2. Borderlands 2 came out a few days ago to pretty solid acclaim, but one person who wasn't entirely thrilled with it is Olly Moss, a U.K.-based artist whose work graces, among other things, the cover of the Resistance 3 box. Thanks to a sharp-eyed fan on Twitter, he discovered yesterday that an image contained in the Borderlands 2 retail package makes use of one of his works, but it was used without permission. 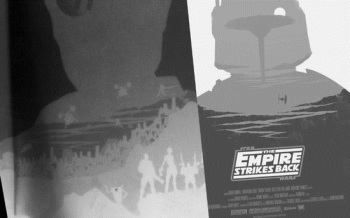 A side-by-side image of Moss' work, an Empire Strikes Back poster, with the image in the Borderlands 2 packaging demonstrates that they're stylistically similar, but more significantly that the jagged ridge in the background is clearly a direct lift from the original. Moss said on Twitter that he was disappointed by the situation, not because of the swipe but because he's a big Gearbox fan and "would have jumped at the opportunity to work with them." Disappointment aside, however, Moss ruled out pursuing the matter further and asked his followers to let it slide. "Legal action? Chill out. It's not a big deal. Just some insert art. Still, would have done it myself if they'd asked. Love their work," he wrote in a later tweet. "Haha! This whole thing is so far from a big deal," he added. "I wish I'd never even said anything." Nonetheless, Gearbox co-founder and CEO Randy Pitchford reached out to Moss when he became aware of the situation and promised that heads would roll. "Check your email. We should be working together to do it right and legit," Pitchford wrote. "You're amazing. Inspiration is part of art and you've inspired us. But the bit that was lifted is uncool, so... consequences." What those consequences may be was left unsaid, but I sure wouldn't want to be the guy who put together that illustration. Props to Moss for being so cool about what is unquestionably an uncool situation, though; you can attract more flies with honey than by yelling on the internet, as the saying goes, and maybe this will end up paying off for him in the end.